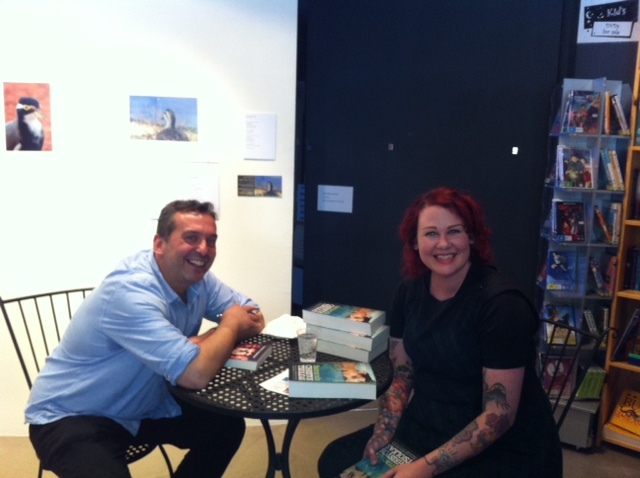 Recently two of our authors came together, as Snake Bite author Christie Thompson met Christos Tsiolkas in Canberra where he was meeting fans and signing copies of new novel Barracuda. Here she recounts the experience, not subscribing to the notion that you should never meet your idols. On the alphabetically ordered shelves of the bookstore, Christie Thompson (that’s me) sits beside her literary idol, one of the biggest names in Australian literature, Christos Tsiolkas. 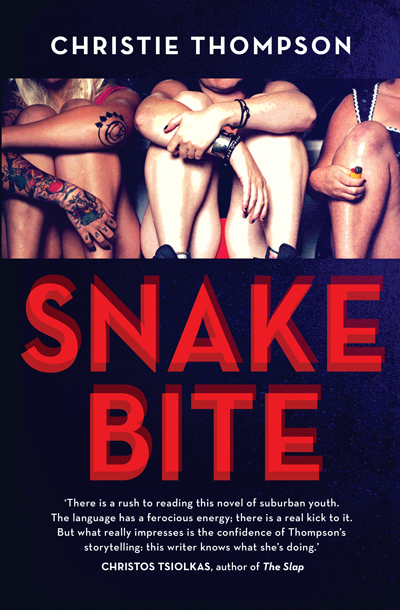 And, as it happens, the cover of my book, Snake Bite, is adorned with a blurb of praise from the great writer himself. So, of course, I’m thinking, can I ride his coat tails into the lucrative Christmas market and get some attention for my own book while readers seek out the highly anticipated Barracuda? I’m joking (sort of). 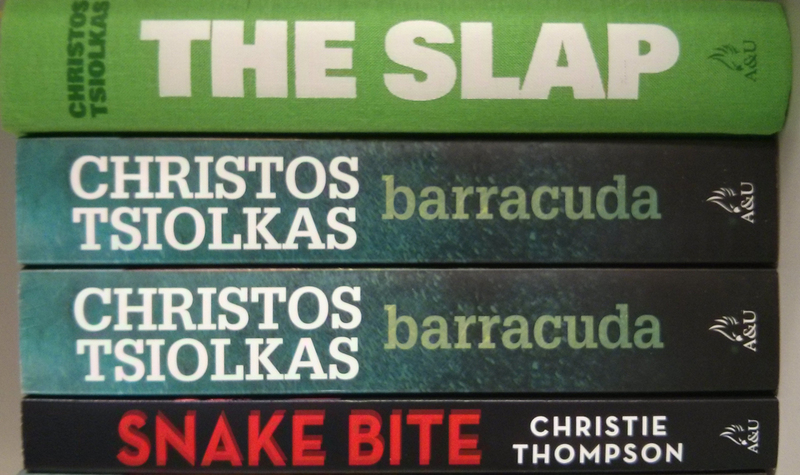 Because if any writer deserves the heights of success and international recognition he has received, it is Christos Tsiolkas. I’m not a gusher. Avare de compliments, as the French say. But my meeting with Christos exceeds my expectations. Although we’ve never met before, Christos greets me with a hug, and as we sit down to chat, I tell him I am two-thirds the way through his new novel, Barracuda. I do a quick double take, examining his face for signs of arrogance or smugness. Surely he must be taking the piss, I think. His last novel sold 1.5 million copies. He must know he is a brilliantly talented writer. But his expression is sincere, apprehensive even. He really wants to know what I think of his new novel. Christos’s brow furrows, just slightly, as though this is a criticism (it’s not). As he reveals later in his talk at the National Library, a writer is never sure his work is good. Unlike Danny Kelly the protagonist of Barracuda, an elite athlete whose success is defined by winning or losing, the writer constantly questions his or her talents. One might assume that after writing a best-seller, the writer would feel validated, assured of his capabilities. It’s a testament to Tsiolkas’s humility that he remains unaffected by his success. Without being asked, Christos is generous with his advice. He knows I’m a young writer, a debut novelist, and I’m ambitious—I want to build a career, a body of work. With Snake Bite, I’m in the position that Tsiolkas was in some 20 years ago with Loaded. He understands where I’m at, talks to me as though I am his equal and I take his advice seriously. I’m ridiculously grateful. I know this is a position any young writer would like to find themselves in. I drive to the NLA to be part of the audience for his live staged interview. Christos is stiltedly thoughtful with his answers (as you can see in this video interview at The Monthly). It is hard to imagine this gentle and articulate man ever blurting out something inappropriate in front of a crowd (unlike me, who once told a packed marquee at a writers’ festival that I had a tattoo of a monkey wanking on my arm). Tsiolkas closes his eyes with deep concentration and stammers endearingly, as though he is under police interrogation and each word he utters might be held against him at a later date. This is a man who has utmost respect for words, the power they hold, the impact that it might have on his audience and the manner in which he is construed as a public figure. 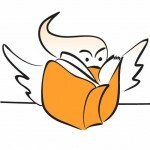 The cover ‘puff’ for Barracuda boasts that ‘there is not a more important writer working in Australia today’ (Australian Bookseller and Publisher). I agree with this statement. Tsiolkas’s work is not just fiction, it is literature. The layers of subtext run deep; his writing deserves to be lauded as a contribution to Australia’s cultural narrative. While many writers contribute something to Australia’s cultural narrative, myself included, Tsiolkas ambitiously tackles the BIG issues: racism, politics, religion, ethnicity and nation. And perhaps the biggest question of all posited in Barracuda: what is it to live a good life? His writing is incisive, probing, confronting and angry. It forces the reader to challenge their own beliefs and identity. It is potentially life-changing stuff. So how did this writer, she of little compliments, she who does not like to gush, feel when she got to meet one of the writers she has most admired, and who has had the greatest influence on her own ambitions? I felt moved. Totally moved. For more from Christie find her on Facebook or Twitter, and have a read of an extract of Snake Bite.